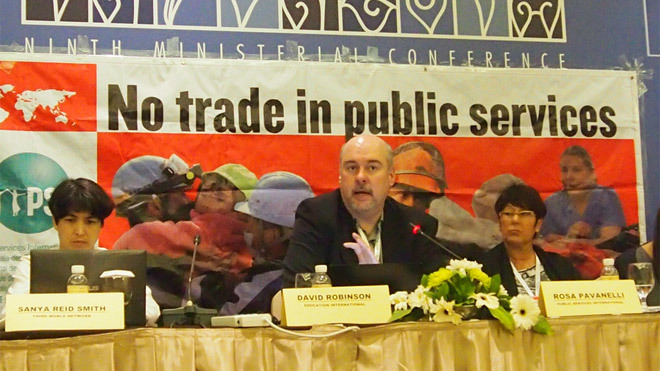 Rosa Pavanelli (right) shares a platform at PSI's Trade In Services Agreement (TISA) forum at the 9th WTO Ministerial Meeting in Bali. Photo: PSI. Fronting themselves as the ‘Really Good Friends of Services’, a group of 50 countries – representing an estimated 70 per cent share of the world’s trade in services – are negotiating the TISA. Talks on this massive trade deal resume behind closed doors in Geneva on 28 April 2014. This is an attempt to secretly extend the most damaging parts of the infamous GATS agreement that previously sparked global protests. Public services serve the good of the community. The global union federation Public Services International and our affiliates around the world are mobilising to tell governments that these vital services must not be sold out to multinational corporations who will charge high user fees and keep all of the profits. PSI has commissioned the first-ever analysis of the devastating effects the TISA will have on our countries and communities. Our new report TISA versus Public Services is written by Scott Sinclair of the Canadian Centre for Policy Alternatives, and Hadrian Mertins-Kirkwood of the Institute of Political Economy, Carleton University. This report outlines how the TISA will lock in the privatisations of services – meaning you can never return water, energy, health, education or other services to public hands. It will also make it harder for your government to expand public services for the common good, in future. Specific sectors under discussion include public and private telecommunication services, electronic commerce, financial services, maritime, air and road transport and energy related services. On 28 April, PSI and civil society allies will launch coordinated actions to protest the TISA in a number of countries, including Switzerland, Australia, the United Kingdom, Japan, India, the Netherlands, Austria, Belgium and Colombia. This agreement is all about making it easier for corporations to make profits and operate with impunity across borders. This is a bad deal for people and our planet. There must be no trade in public services. One Response to Why is the Trade in Services Agreement (TISA) a bad deal? Another concerning Touchstone report. Thankyou for your article Rosa Pavanelli, I shall now follow this with interest. (Whenever negotiations are being conducted in secret then this automatically concerns me). Your last paragraph shows how alarming TISA’s really could be. I would be very interested to know how the country where I live voted on this issue. Will the results be made public? The best of luck .